Murabella community in Jacksonville, Florida. 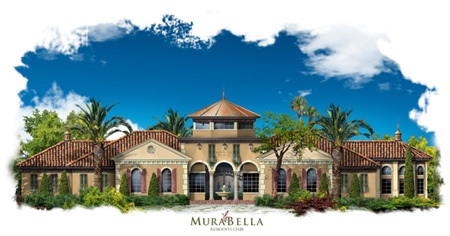 Murabella is a Tuscan-inspired, 740 single-family homes, master-planned community located in Northen St. Johns County. Evidenced by the community's beautiful location and proximity to beaches and waterways, MuraBella embraces the spirit of la dolce vita "the sweet life." Located just three miles west of I-95 off International Golf Parkway, MuraBella is perfectly situated to enjoy some of the best golf courses, beaches, boating, entertainment, shopping, and schools found throughout Northeast Florida. Highlighted by sixty-five, seventy-five, and eighty-five foot wide homesites, MuraBella offers potential homebuyers all the benefits of living on Florida's First Coast while basking in a stunning setting inspired by the beauty of Italy's Tuscany region. Residents enjoy a 3,842-square-foot clubhouse featuring a party room, kitchen, fitness center, swimming pool with waterslide tower, a soccer field, softball diamond, tennis courts, a sand volleyball court, playground, multi-purpose court and amphitheater. The community's builders are Lennar Homes, Standard Pacific Homes, CornerStone Homes and Toll Brothers.